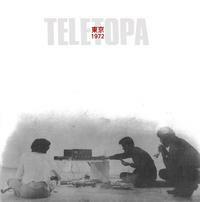 Teletopa "Tokyo 1972" 2CD/3LP In 1968 the young Sydney composer David Ahern studied in Germany with Stockhausen where he met Cornelius Cardew. The next year he travelled onto London attending Cardew’s classes in ‘Experimental Music’ at Morley College and - in a mammoth seven-hour concert at the Roundhouse on 4 May - participated (with Cardew) in performances of La Monte Young’s String Trio and also took part in the realisation of Paragraph 2 of Cardew’s The Great Learning which proved to be the catalyst for the formation of the Scratch Orchestra. These were revolutionary and defining moments in 20th century music. Returning to Sydney in 1970, one of Ahern's aims was to set up an electro-acoustic improvisation group - Teletopa was founded in Sydney in late 1970 by Ahern, Peter Evans and Roger Frampton. Tokyo 1972 features two 50 minute improvisations from a radio session at NHK studios Tokyo. The group was Ahern, Frampton, Evans and Geoffrey Collins and they were completing a 1972 world tour. The group broke up on their return to Sydney. Only a small example of their work has ever been released before. Packaged as a multi-panel digipak (the double CD version) and screen printed (triple LP) cover,The Liner notes include an Ahern manifesto from a 1971 pamphlet, and a newly penned "Potted History of Teletopa" by former member Geoffrey Barnard. The tapes have sat in boxes for 42 years. With this release we can hear that Sydney in the early 1970's had a group at the forefront of musical experimentation with a unique take on free improvisation.